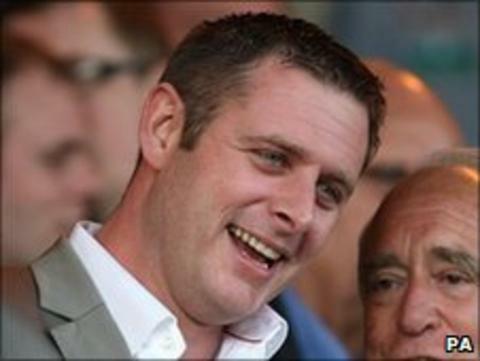 Peterborough United chairman Darragh MacAnthony says he has lined up a signing that would break the club's record transfer fee. The unnamed striker is being touted as a replacement for Craig Mackail-Smith. The club have confirmed they have for their 35-goal top scorer. "We've made a very substantial offer already for a striker we feel will do great things for this club," MacAnthony told BBC Radio Cambridgeshire. "That would smash our record by a mile and that's already in place, we're just niggling over the finer points of it." MacAnthony described the target as a "young, up and coming" forward, and added his summer spending would not be restricted to that one signing, with "between eight and 12 players" on the short list. "The players we're bringing in they'll mostly be for fees," he said. "Some will be frees, a few may be loan players we previously had that we're trying to sign, but more than half of them are going to come with fees and substantial fees. "They're of the age and the ilk that they'll be worth a lot more money in a year's time in the Championship." In terms of potential departures, MacAnthony reiterated that goalkeeper Joe Lewis, Posh's current record buy at £400,000, would still be leaving despite facing a pre-season of rehabilitation from injury. Meanwhile Charlie Lee, James Wesolowski, Lee Frecklington, Chris Whelpdale, Kelvin Langmead, Scott Griffiths, Exodus Geohaghon, Dominic Green and Arron Davies have all been made available for transfer.